MUU, MOO is an illustrated bilingual edition of sixteen animal nursery rhymes. Selection are based on traditional oral Spanish folklore from Mexico, Puerto Rico, Cuba, the Dominican Republic and Central America. Also included are verses created by Alma Flor Ada and F. Isabel Campoy who aim to keep folklore alive by sharing traditions which they hope will also inspire contemporary work. English versions are not exact word for word translations but instead themselves poetic renditions. As stated in the introduction, the authors offer this selection of nursery rhymes to Latinos to bridge a gap between Latino history and culture while also encouraging an appreciation for bilingualism. For the audience of English speaking children, Ada and Campoy hope to share the charm and delightful animal stories of the Latino culture. Vivi Escriva's magnificent illustrations bring the words to life with a sense or wonder, warmth and charm. Even insects take on a new life under the illustrator's paintbrush. Rural scenes and depictions of Latino clothing bring readers a sense of cultural tradition. MUU MOO portrays both girls and boys as central characters of the nursery rhymes. Illustration and verse together describe the magical world of such animals as the mouse, the duck, the rooster, the turtle dove, the rabbit, the donkey, the meadow toad, cats and mice, insects and more. 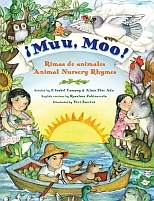 MUU MOO is a great choice for both English and Spanish parents wanting to encourage bilingualism in their children precisely because the illustrations and nursery rhymes naturally draw one inside this delightful book. MUU MOO is a book parents and children will enjoy together. MUU MOO is highly recommended for public libraries and school libraries. As a reader who taught French for several years, I was immediately struck by MUU MOO. What a wonderful resource for Spanish teachers and English as a Second Language instructors of all ages from elementary school to beginning college classes! The verses would make wonderful supplemental pronunciation exercises, not only with the rhyme and repetition of the poetry, also because the stories are just fun. In addition, Spanish teachers would be able to share authentic cultural heritage while focusing on language. If you are a Spanish teacher, I highly recommend this book for evaluation for inclusion into your classroom.